Designed in 1934 by Joseph Sorkin of the state highway department, the Loup River Bridge demonstrated the potential of cantilever construction. By suspending spans between cantilevered girders, Sorkin discovered, it was possible to build much longer spans, thus reducing the number of piers and their associated cost. The state first experimented with cantilevered I-beam construction in 1932, refining its design over the following years. 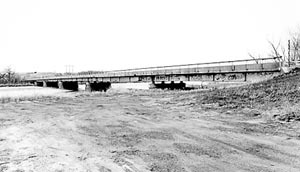 Fabricated by the Omaha Steel Works and erected by the Norfolk Bridge and Construction Company of Norfolk, Nebraska, the Loup River Bridge effectively demonstrated the department's progress two years later. Its 115-foot central span was reportedly "the longest deck steel girder highway bridge span constructed of standard rolled beams . . . in the United States." The Loup River Bridge is thus important for its role in the development of cantilevered deck girder construction in Nebraska.